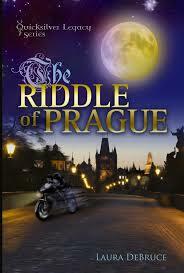 The Riddle of Prague by Laura DeBruce. CreateSpace, 2013. Currently available. Face Value: I read an e-book copy and didn’t spend a lot of time looking at the cover, but I really do like the image. There is an air of mystery and adventure, and the title fonts blend the ancient and contemporary elements that intermingle in the story. Does it break the slate? This book is chock-full of amazing female characters, but I’m still waiting for Hana (the protagonist) to break the slate. She grows immensely in this story but I’m still waiting for her to take some major action. I’m glad that I have a sequel to look forward to, because Hana’s future as a Slatebreaker is promising. Review: I hate thinking about mortality. I know that this is a blessing and a privilege of being a young millennial. I am healthy and fortunate to be that way. But sometimes you have to think about the reality of death. We don’t live forever. The people we love don’t live forever. In a strange coincidence of the universe, I was reading The Riddle of Prague while some tough stuff happened in my personal life. And it helped me to better understand why this cast of characters would do almost anything in pursuit of immortality. Hana Silna is not even out of high school yet, but she still has some big responsibilities. She has been tasked with the job of traveling to Prague and signing the paperwork to reclaim ownership of her family home. Her mother left Prague long ago to avoid political unrest, but the family still has connections there. Hana’s trip gives her the opportunity to connect with her roots – and to discover that they are far deeper than she ever could have imagined. Hana inadvertently stumbles upon a plot that involves notable Renaissance thinkers, complex issues of race and class, and the desire to live forever. She learns of Edward Kelley and his flask of a concoction that will help someone live forever. Hana cannot help but thing of her mom, who is battling potentially terminal illness, and also desire the flask. Although Hana never asked to be involved in this crazy scenario, she responds admirably. She has met many new people in Prague and has to rely on her gut instincts about who to trust and who to avoid. Hana sees some terrible things happen, and she sets out to avenge people who she believes were wrong. It is heartening to see a character stick her neck out for strangers simply because she believes they are doing the right thing. DeBruce has crafted an intricate plot that blends Renaissance intrigue with contemporary socio-political dynamics in the Czech Republic. The fast pace of the story kept me reading. I didn’t want to put this book down. At times I felt that the pace was almost too quick. I occasionally lost track of who was collaborating with whom. Setting is an important element of this story, with Hana’s family home and other landmarks of Prague and surrounding cities playing starring roles. I wish that the pace were ever-so-slightly more deliberate so that I could have appreciated the settings and the way they affected the plot. I don’t want to give away any key plot points because I strongly recommend you dive into this adventurous book yourself. But DeBruce did something that I love and just have to talk about. She made some of the villains and traitors female! I am so sick of fantasy or mystery stories that feature a strong and virtuous female protagonist up against a typical smarmy evil guy. Sure, that’s a functional storyline, but women have the capacity for evil too. Even the more traditionally “good” female characters have flaws and have made mistakes. They are multi-dimensional women who have made good choices and bad choices, just as anyone would expect. I look forward to seeing how both the “goodies” and the “baddies” develop further in the sequel to Riddle of Prague. This entry was posted in Reviews, Young Adult and tagged Czech Republic, Fantasy, immortality, Prague, Renaissance. Bookmark the permalink. Thank you for reading The Riddle of Prague. And thank you for having faith in Hana Silna as a potential future slatebreaker! She’s working on that. She’ll be back in The Temple of Paris this summer.